I hope you all had a refreshing Thanksgiving Break! I had a wonderful break, but because of traveling I am behind on all kinds of things at home like laundry, outdoor Christmas decorations, etc. Speaking of Christmas decorations, a few of my students brought back their 3D ornament. See post below for explanation. The one on the right is a drawing of the 3 wise men going to see Jesus. Awww! During our enrichment time, students are split into three groups based on ability from recent state standardized tests. Love it or hate it, that's the way we are doing it this year. I have a group that needs additional instruction in most areas. We needed a break from extra math instruction so we did an animal research project. I had a guideline of things I was looking for when they researched. We went to the library and checked out books, wrote a first draft, peer edited, had a mini conference with me, revised, and wrote final drafts. Here are our results! Today we started a unit on light. Our starter activity on light is for students to work with a partner and make a T-chart that displays things that produce light and things that do not produce light. We displayed them in the hallway! Tonight I want to share with you how we celebrate Veteran's Day at my school and in my room. I brought up the discussion "What is a veteran?" to my class and let my students share their thoughts and questions. Most had a good idea of what it means to be a veteran, how we should be so thankful and appreciative to our veteran's, etc. So many hands started popping up "My uncle was in the war", "My papa was in the Navy", so I allowed every student to share if they had a family member in the military and a little about them. The kids loved hearing it and I thought it was interesting. I shared that my Papa was in Vietnam, my father-in-law is a retired Colonel of the Tennessee National Guard, and my brother-in-law also served in the Tennessee National Guard. 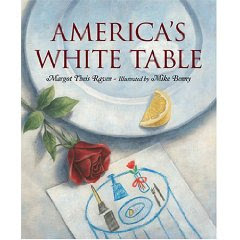 Then, I read the book "America's White Table", which almost brought tears to my own eyes and did bring tears to one students eyes. I felt like they really "got it". We wrote letters to veterans that a local church was sponsoring which gave me the idea to have my students write letters to a veteran I highly respect: my father-in-law. We started by discussing what we might say to him and I wrote some words that they might need help spelling. After they wrote their first drafts, I had a writing conference with each of them, and then allowed them to start on their final drafts. My father-in-law is a retired Colonel but has a job where he is helping to train soldiers. The kids were pretty interested in that. I cannot WAIT to send these letters to him! We also had a Veteran's Day assembly that was really good. Did you do anything special for Veterans Day? We are still in the middle of our astronomy unit and we have started a monthly moon sketch. Each student got a copy of a calendar of the month of November and we are doing nightly moon sketches. You should've seen the kids faces when I told them they had to do it this weekend (we never give homework over the weekend). I had to remind that it only takes about 30 seconds to look outside at the moon and draw it! 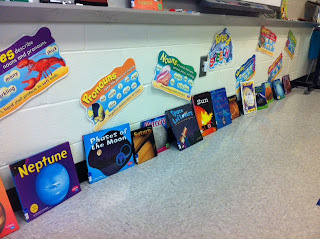 I checked out lots of books from the library to go with our astronomy unit that the kids can read during independent reading or as an early finisher. Most of them have read them! 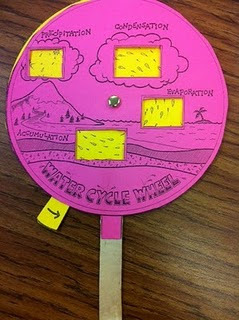 I've had several requests to share the water cycle wheel template and I think I have finally figured out Google Documents and linked it to this photo! If it doesn't work, bear with me! 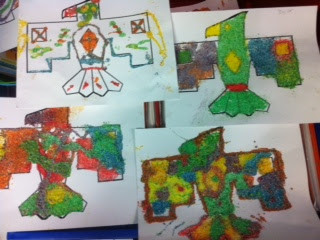 I also wanted to share the templates we used for our Native American sand art painting. I recommend printing it off on cardstock! Click HERE and HERE to get those templates! I hope these will be beneficial to you! Please let me know if these links do not work for you! I have changed the settings so you should be able to view! This week we have been studying about astronomy. I think it can be a hard topic to teach. The kids always have so many questions about it, but they ask some HARD questions! My go to response if I don't know, "Great question. Let's research that!" 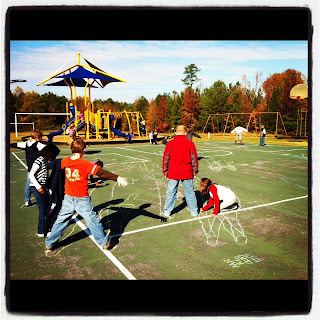 One activity we do is a shadow activity. I pair the kids up in groups of 2 and let them decide who is the artist and who is the statue. 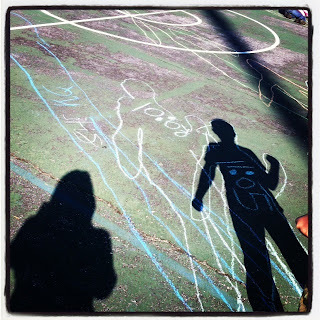 We go outside (weather-permitting, of course) and the statue chooses a position and the artist traces their shadow using chalk. We put the time inside/beside the shadow. Then, we go back outside every hour and do the same thing, with the statue standing in the exact same position. Side note: Because of lunch, activity, CLOUDS, we only did it 3 times but you still get the same effect. Here, you can see some examples of what our shadows looked like at 8:45, 10:00, and 11:05. 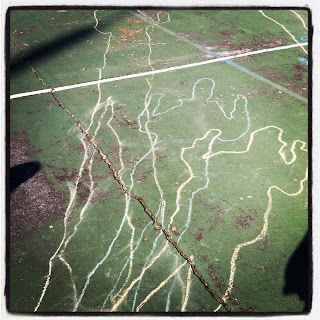 My students did such a great job understanding the time of day based on the shadow. I had a picture on the Smartboard of a boy standing with a shadow and we talked about how the sun rises in the east and sets in the west and then determined if he was facing the west, what time of day it would be! Hard topic for 4th graders, but I felt like they really got it! 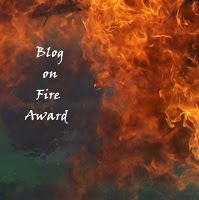 I want to say THANK YOU to Tara over at 4th Grade Frolics for awarding me with the "Blog on Fire Award". 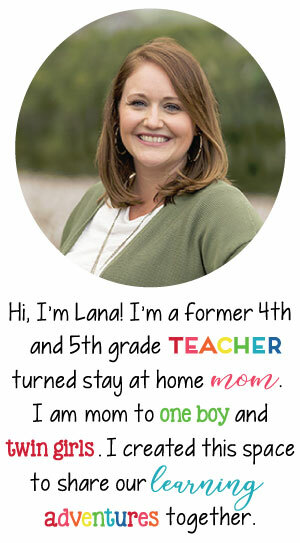 I LOVE, LOVE, LOVE her blog! Go check it out! With this award, I am supposed to tell 7 facts about myself and pass it on to 7 bloggers. 2. I absolutely hate to iron. Hate, hate, hate. 3. I once thought I wanted to be a nurse and a photographer. Teaching is absolutely the right profession for me! 4. This may be too much information, but I had natural childbirth...no epidural. Not by choice, but still proud to say I did it. 5. I am a lifetime member at Weight Watchers. 6. I played basketball for many years of my life. Now to pass this on!